We all know that international travel is fun and enticing, but at the same time, it can be tiring and inconvenient – and it’s not just about getting jetlagged. The most puzzling scenario for many people is related to cell phone usage. Questions like “How can I use my mobile phone while traveling?” or “What’s the best way to use a cell phone during international travel?” are asked by many, but effectively answered by a few. In this article, various options are discussed briefly. These options are cost-effective and generally wouldn’t break your bank, unlike international roaming. Phone rentals are quite common and a cheaper alternative to activating international roaming when you are traveling. You can rent a handset before you are set to travel or after you arrive at your destination. This option can be considered if you are going on a very short trip or on a medium length trip. The good thing about phone rentals is that you will only be charged for the minutes you use as the phone comes with the minutes already added. Outbound calls are lower, while inbound calls are usually free. Though this option doesn’t necessarily include the use of a cell phone, it is a much better alternative to paying for those exorbitant roaming costs. This is useful for people traveling for a longer-term period for the purpose of leisure and adventure. You can connect your laptop or your phone, (provided you have the Skype app) to wireless hotspots and call your loved ones for free. Even if the Wi-Fi is not free, the cost is normally very low. Besides Skype, you can use other VoIP apps like Viber and Whatsapp to communicate with friends and family. Wraptel offers free inbound calls and even lower outbound calls when using the Wraptel VoIP app. (Note: The Wraptel VoIP App is currentlly discontinued however it is on our roadmap to integrate it and relaunch as soon as possible). This app can make calls to any land or mobile line and is exclusive to all Wraptel customers. However, keep in mind that these apps require internet access in order to work and the quality of calls placed will depend on the speed of the connection. Public WIFI spaces can be a haven for hackers trying to connect into your devices and steal information. Be cautious when connecting to WIFI when overseas especially Free WiFI. Although the use of calling cards has decreased in recent years, they are still used nevertheless. If you have a local SIM, but didn’t activate roaming and there’s no internet access, you can use calling cards as well. If you use a payphone, the cost will be very low, usually a few cents per minute. 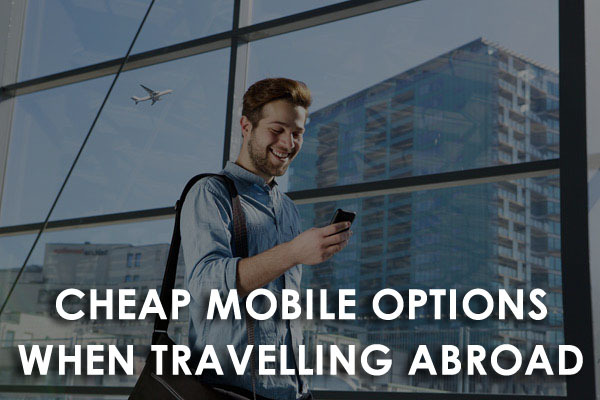 On the other hand, using your mobile phone will be a bit more expensive, but still much cheaper than roaming. As is always, the best and most cost-effective solution is to buy a SIM card. However, if you choose this route, you have two options; you can either buy a local SIM card of the country you’re in or buy an international SIM card. International SIM cards are different from the local SIM card of your home country in a way that they work over multiple carriers across the world. If you choose this option, note that your mobile device must be unlocked to use any SIM cards (local or international) other than the carrier you use at home. For iPhone users, check to see which iPhone model can use an international SIM card. They are suited for people whose trips are shorter such as business trips, but they are more expensive in comparison to local SIM cards of your destination. Purchasing a local SIM card is currently the cheapest alternative, suitable for those who stay in one country for more than a week. Wraptel offers international SIM cards that offer low cost data, talk, and text capabilities in over 200 countries around the globe. Whether you have an iPhone or an android mobile device, Wraptel has you covered. For a limited time, Wraptel is giving away its international prepaid SIM card for free; click here to order yours today.